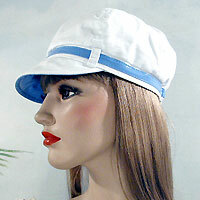 White fabric cap with colored band and under visor. There is a strip of elastic to keetp it snug. 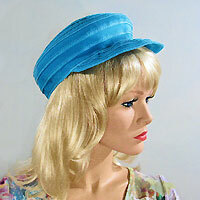 Color: light blue. Hue: Surf. color code: #97D4FF. Measurements: width 7½", depth 10"
Color: hot pink. Hue: hot pink. color code: #FF97AB. 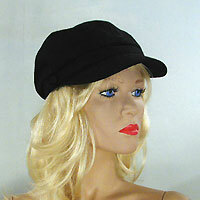 Cute newsboy cap in bright colors made from rows of grosgrain ribbon stitched toether. 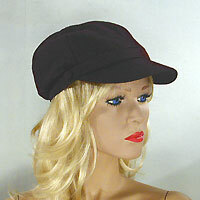 This hat includes an elastic cord under the band so you can tighten it for a perfect fit. 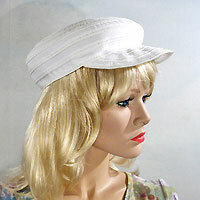 Measurements: width 8", depth 4"
Cap with a buttoned band in front and bill. 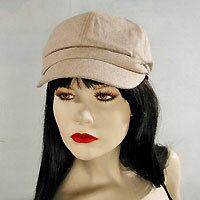 This cap has the look and feel of wool and is perfect for winter. 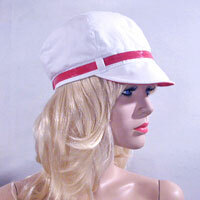 The back has a small elastic band to keep it in place. Color: brown. Hue: chestnut. color code: #6A4D00.